Please visit the original Citizen-Times SOURCE ARTICLE for additional photographs. The Buncombe real estate market continues to boom, but real estate agents have an unusual problem: They need more homes to sell. An empty car dealership, a truck garage and a ruined plant that once supplied people with ice could all become housing for moderate- and low-income city residents. The sites in and near downtown are among 15 acres of public property undergoing a city-commissioned study for suitability as affordable housing. Asheville is throwing the $15 million in property plus another $15 million of local taxpayer funding into its battle to decrease housing costs. Redeveloping city land is a “key strategy” for pushing back against Asheville’s sky-high rents and mortgages, said Heather Dillashaw, the city’s community development director which oversees affordable housing programs. “It’s one of the ways we believe we can accomplish a substantial number of units,” Dillashaw told City Council members Tuesday. Demand for below-market rate apartments is high, with occupancy rates of tax-credit and government-subsidized units near 100 percent, according to a December 2016 report of Asheville and Buncombe County housing. Redeveloping city land was a popular idea among voters in 2016, with voters overwhelmingly supporting a $25 million in housing bond borrowing to be paid back through higher property taxes. The $15 million spent on the land would come from that bond money. But the details aren’t clear yet about how the land deals with private developers would work. Questions include how many units would be built, how much rents or mortgages would be for residents and how long the units would stay at below-market rates. Critics of a similar deal in June involving city property at 338 Hilliard Ave. said the rents, then estimated as low as $603 a month for a single-bedroom apartment, were still too expensive. To hammer out details about the sites, the council voted unanimously Tuesday to hire Atlanta consultant Lord Aeck Sargent for $240,660. A geotechnical firm will also be hired. City staff gave no price tag for that service. A decision on whether to use all, some or none of the properties is expected in September. The properties are: 171-127 S. Charlotte St. downtown where the city garages and the ABC store now stand, 91 Riverside Drive in the River Arts District site at the site of a demolished ice plant and 319 Biltmore Ave., which is north of Mission Hospital and once the site of a Ford dealership. It’s owned by Duke Energy but Asheville has an option to buy it for $5.3 million. After the 2016 bond passage, plans had focused on South Charlotte Street. The nearly 8-acre site “really is the connective tissue between downtown and the East End/Valley Street neighborhood,” said Steph Monson Dahl, the city strategic development director who is on the project team with Dillashaw. The land was once a link between the historic African-American business district and a black neighborhood. It was obtained through urban renewal, said Monson Dahl who is also helping lead the River Arts District infrastructure overhaul. One hurdle with the property would be dealing with decades of pollutants from storing and maintaining city garbage trucks and other vehicles. Another would be the need to find another site for city vehicles. In February, city staff suggested expanding the project to study the three sites. The council agreed. “One thing is they are in growing commercial corridors that already have a lot of mixed use,” she said. The Riverside Drive land is in the middle of a historic infrastructure overhaul in the River Arts District, while the old car dealership is on the edge of Lee Walker Heights, the city’s oldest public housing complex, which officials hope to transform into a mixed-income neighborhood. Monson Dahl said discussions with neighbors and “hidden stakeholders” would be a big part of analyzing the properties. Number of affordable units possible. Percent whose prices would stay permanently affordable and not change at some point into market-rate units. Sustainability and achievement of other city goals. The city needs help figuring out how the properties stack up in these categories, so they looked for a company with experience, putting out a “request for qualifications” in May. Lord Aeck Sargent beat out six other applicants, including five from Asheville and one from Aspen, Colorado. The company will be responsible for “design, land planning, engineering, financial feasibility and consulting services necessary to perform the due diligence,” according to a Tuesday report presented to the council by Dillashaw, Monson Dahl and city Real Estate Manager Nikki Reid. “The professional team of Lord Aeck Sargent was well-qualified in all required disciplines, with extensive experience in urban redevelopment, affordable housing financials and technical assessments,” the report said. The company has sub-consultants listed as minority business enterprises and has consultant team members in Asheville and Atlanta. Vice Mayor Gwen Wisler raised concerns about the deadline the city has to spend the bond money, which according to state law is November 2023. Wisler asked how would the staff be recommending the city actually use the money. “What would that look like?” she said. Monson Dahl said much of that answer would come from the consultant. Assistant City Manager Cathy Ball said it would be different with each site. At the former car dealership, bond money would be used to buy it from Duke and possibly do demolition and grading. At South Charlotte Street, money would be used to find a new site for the fleet and clean up pollution. An additional benefit of the cleanup would be restoration of a stream running beneath the site, Town Branch, staff have said. Garages, car dealerships = affordable housing? 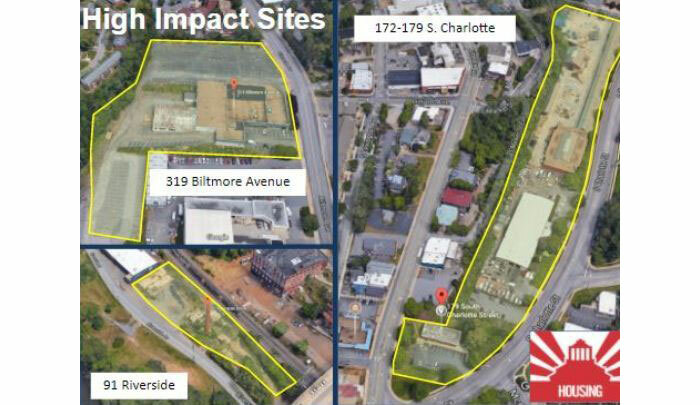 *171-127 South Charlotte Street 7.6 acres on the eastern edge of downtown valued at $8.3 million – Now houses city garages and the ABC store. *91 Riverside Drive 1.8 acres in the River Arts District valued at $966,000. The site of a demolished ice plant. *319 Biltmore Avenue 5.5 acres south of downtown. Once the home to a Ford dealership. It’s not owned by the city, but Asheville has an option to buy it from Duke Energy for $5.3 million.